Constructed from the finest materials in the industry, the Nova™ is the most customizable and reliable table on the market. 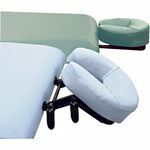 The Nova™ boasts an exceptional variety of options, widths and height ranges to easily accommodate any size therapist and/or bodywork modality. 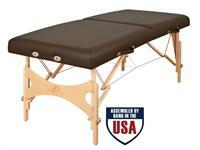 A table built to last a lifetime, the Nova™ has been the preferred choice among massage professionals for over 25 years. New technology in padding options now gives you 4” of more resilient support with a softness that conforms to the body’s curves.